At a ceremony held the evening of April 7 in Cox Hall, seven Emory professors received Crystal Apple Awards for excellence in teaching. President Jim Wagner (standing, center) delivered the event’s keynote address. 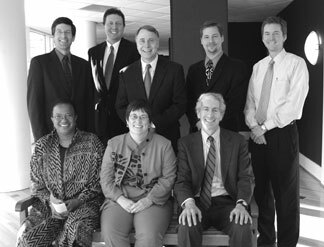 The 2004 Crystal Apple winners are (clockwise from top left) Eric Nelson (music), Benjamin Freed (anthropology), Wagner, Clifford Carrubba (political science), Matthew Weinschenk (chemistry), Richard Doernberg (law), Sheila Tefft (journalism) and Jacqueline Jordan Irvine (educational studies). The awards are presented annually by the Student Government Association and Residence Life. Photo by Ann Borden. Emory Profile: Susan Lee and Jodi Gup: Relay Team: Susan Lee (left), manager of faculty appointments in Emory College administration, and Jodi Gup, senior director of the Emory Parent Program in Institutional Advancement, are driving forces behind the planning and promotion of the American Cancer Society’s Intown/Emory Relay for Life, one of the organization’s biggest fundraising drives. Lee and Gup have toured campus over the past few months giving presentations and recruiting volunteers. Their efforts have been rewarded; the 2004 overnight relay boasts more participation from Emory faculty and staff than ever before. Photo by Jon Rou.